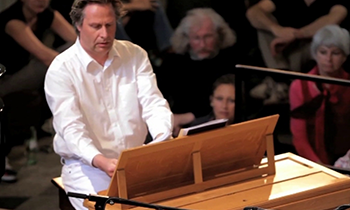 Born in Wolfsburg Andreas Pasemann took his first organ lessons from Brunswick’s Cathedral Choirmaster, Helmut Kruse. From 1984 to 1990 he studied church music at the Hanover University of Music and Drama under Professor Ulrich Bremsteller and under Professor Michael Leuschner for piano. After winning a scholarship from Lower Saxony’s savings bank he was able to continue his studies under Professors Daniel Roth and Gaston Litaize in Paris, qualifying his A- Diploma in 1990. Since then he has been organist at Brunswick’s cathedral and is deputy head of the cathedral’s choir school. Since 1996 Pasemann has been cantor at Seesen (Harz), where he has led a very wide range of choirs and instrumental groups. He tours regularly throughout Germany and all over Europe. Alongside his academic work, Pasemann is a much sought after organist and accompanist for recordings, TV drama and film music. In addition to the organ and the piano he plays the Celtic harp.